This incident took place in Woodville, 130km north of Wellington, New Zealand. This is about a cow named 569 who saved her owner from swirling flood waters. Now more than six years after her dramatic rescue, Cow 569 is leading a somewhat charmed existence. She grabbed headlines around the world during the floods in February 2004 after her owner, Mrs Riley was swept away by the swollen Manawatu River on the Woodville dairy farm. ​the night so they moved the cows to higher ground the next morning not realising, in the dark, that the water had come right up to the cowshed. "They were spooked in the dark, as they must have known the water was there, but I hadn't seen it in the dark. The next thing I know they were all floating, so I shot out to head them off and I ended up floating between them," Riley recalls. Mrs Riley was hampered by her wet weather gear and gum boots, and members of her herd, who kept swimming over her. "I drank a fair bit of water and it was foul muck. There was lots of flotsam around and weeds get tangled up in your arms: it was quite exhausting," she says. She really started to worry when she tried to grab hold of a passing tree, and the top of a fence, but missed both as she was swept away by the current. "I thought if I was washed into the main river I would be gone," she adds. That was when the farmer spotted her salvation. "I just laid back and relaxed ... take me on home!" When they reached solid ground, 30 metres (98 feet) away, they both sat there "puffing, and shaking a little bit". She was delighted to find most of her cows gathered on higher ground. All but about 15 of her 350-strong herd survived. The Friesian cow is now in her 16th year, completely unaware of the fuss she caused, and set to “retire gracefully”. Her actions during the flood meant Mrs Riley would never be able to bring herself to send Cow 569 to slaughter – even when she stopped producing milk. Despite it being nearly seven years since the cow became a household name, people still asked about her. Mrs Riley is still unsure about whether Cow 569 appreciates the attention she has gained. A bout of mastitis put Cow 569 in “semi-retirement” this year, and she now has her own paddock, looking after an adopted calf nicknamed “Brick”. After the rescue, Mrs Riley wrote the bestselling children’s book Cow Power about Cow 569, and says the cow not only saved her life, she also helped her discover new opportunities. The Rileys plan to get Cow 569 pregnant again, but, for now, the “boss cow” who is an above average producer is taking it easy. But shouldn’t all the cows, or rather all the animals, should share the fate of cow 569. Aren’t all cows benefitting us, rendering selfless service to us? Its not just Cow 569 that has saved some one, in fact all cows and bulls, since thousands of years have saved human civilization from starving to death. Before the introduction of fossil fuels, hundred and fifty years ago, bull provided the necessary power to grow food and establish infrastructure. And cow has been supplying milk, the most essential of all foods since time immemorial. We owe these innocent big eyed creatures a lot. There are lots of crusades around today: Save the Whale, Save the Seal, Save the Endangered Species. That’s good... we can’t keep killing animals and expect there to be peace in the world. Actually, there are laws of nature at work here which are inescapable... laws of God which are controlling our lives. And if we’re going to make so many campaigns to save this animal and that animal, let’s not make campaigns just because they’re going extinct. That means we want to save these creatures not out of compassion, not out of mercy, but just because we like to have them around for our own amusement. That shouldn’t be the only reason we want to save animals. We should protect the animals because they happen to be God’s creatures, first and foremost. We have to realize that wherever there is consciousness, there is a soul present there-whether in a tree, or an insect, or human, or animal-and we have no right to unnecessarily disturb any soul, in any kind of body. We shouldn’t even cut down trees unnecessarily. We shouldn’t even kill a fly unnecessarily, what to speak of the cow! Let’s face it, of all the creatures that God has put under our dominion here on this earth, no creature is as generous as the cow. Practically speaking, all of us grew up and became strong by the mercy of the cow. It wouldn’t be sentimental or crazy to say that in one sense the cow is like our mother. Every one of us was nourished by the cow. Therefore, if we’re going to be kind to every creature, let’s start with the most generous creature. Let’s be grateful. Let’s actually show that we have a higher, spiritual awareness. Let’s wake up from the nightmare of the most widespread injustice of all. Don’t be fooled by all these fast-talking politicians. Our modern leaders are trying to keep us in darkness and exploit us. Of course they’re gonna tell you it’s alright to kill the cow-because it’s good business for them. Why should they care? Why should they care what your karma is going to be? Why should they care what’s going to happen to you? Why should they care about your consciousness-as long as they can get the money out of your pocket? Therefore we must be prepared to struggle, to enlighten people about the real purpose of life, which is spiritual about the laws of God, which forbid the unnecessary killing of any creature. And the real leaders are those who are willing to stand up at any cost and tell you these things. Let’s give the cows and all innocent beings our protection. We must stand up for the rights of our fellow citizens of the earth who can’t stand up for themselves. Let’s close the slaughterhouses. Let’s boycott the restaurants and supermarkets. Let’s speak out. Let’s distribute our literature. Let’s change people’s minds. Let’s change people’s hearts. Let’s save the cow. Don’t worry what your neighbor may think-- Save the Cow! So a sensible person is appalled at how human society treats the cow. The sarcastic expression “sacred cow,” for example, as well as the expletive “holy cow!” pain us because they evidence a disrespect, deeply rooted in the language itself, the cow’s life. Modern civilised man thinks himself too smart, too scientifically advanced, too free from superstition, artificial piety, and notions of transcendence to respect, what to speak of worship, an animal. But we don’t ask you to worship. Fact is, the cow is the mother of human society because she provides milk, which is a delicious and indispensable part of man’s diet. How many tons of milk, yogurt, cheese, ice cream, and butter man consumes daily! And yet how many cows are daily led to slaughter? Never mind piety or transcendence. What really matters is something much more down-to-earth, something no civilisation can ignore if it wants to survive for more than a few centuries. It’s called gratitude. In this case gratitude toward a very real mother. And it is intimately connected with other indispensable qualities, like mercy and compassion. How much more men might show civilised gratitude and compassion toward each other if they could show it toward their mother. Animal-killing is not civilised. Cow-killing is indescribably base. So leave the cow worship to us. You need to work on preliminaries like respect for your mother and gratefulness for how she feeds you. I even saw a five-legged cow, that was far holier than those from my farm in Australia. 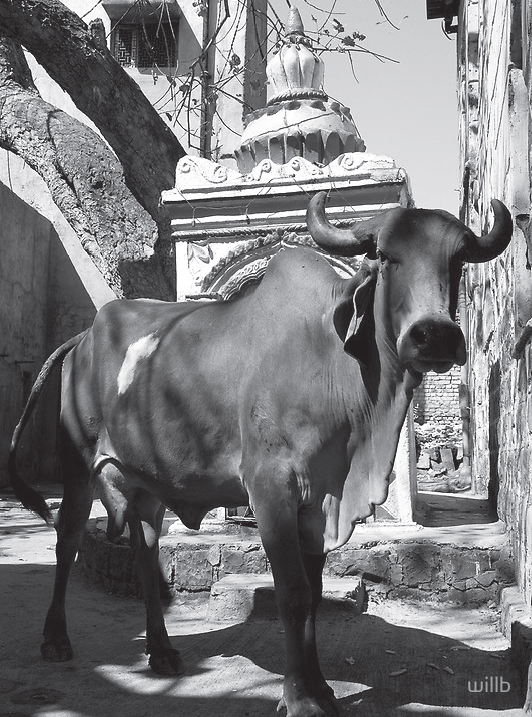 I have developed a strange relationship with cows after being in North India, where the Brahmin bulls stand taller than me – and I’m 6 foot 3! I’d grown on a cattle farm in Australia where the black cows we knew were terrified of us from birth, it was amazing to be able to touch and feed these holy beasts as they nonchalantly stood in the middle of the chaotic roads. They really are more intelligent than I’d guessed. The cows in Australia know that they are food, and yet here they are Gods – and again they know it.